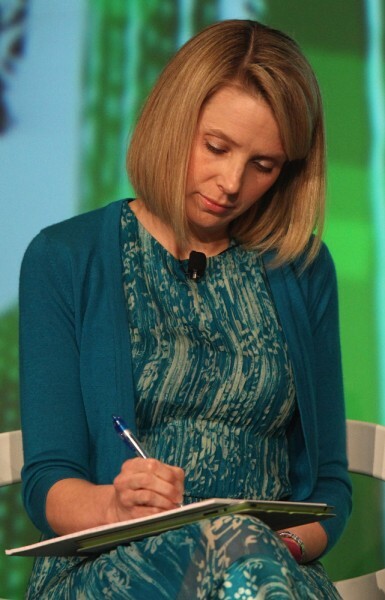 Marissa Mayer, pictured in May, before her big CEO/baby announcement. Wonder what she's writing? "Mason.... no, too popular. William.... no, I knew a Will who was mean to me in middle school." Yahoo CEO Marissa Mayer gave birth to a healthy baby boy on Sunday, but is having some trouble coming up with the right name for her firstborn. Baby Boy Bogue started making news in utero, when Mayer was selected as Yahoo's new CEO -- and announced her pregnancy the same day, making her a role model for working moms. She also announced her intention to take just a few weeks of maternity leave, sparking a debate among those same working moms about whether she's a good or bad role model. Maybe "crowdsourcing" her child’s name is a clever way to get people talking about Yahoo and its innovative new mom-CEO. Maybe, in the Internet-age of snap polls and live tweeting your labor, it’s the future of baby naming, and we’ll all be soliciting social media help to name our babies. Or maybe when Baby Boy Bogue arrived, he just didn't look like the name they'd picked out. Regardless, don’t worry, Marissa: you are not alone. “Choosing a name for a child feels monumental,” says Kate Bayless, a freelance writer and mother of three. Five years ago, she and her husband were in the same position as Mayer and Bogue. A day after their son was born he had no name, and they were still calling him Baby Boy Bayless. “It feels as if you are determining their future, setting their career, their life happiness, and certainly their middle school teasing likelihood with this one decision," she said. Her advice? Start brainstorming the minute you find out you're pregnant. It can take months to find names you and your spouse agree on, so give yourself plenty of time, she says. And always stay for the movie credits. She and her husband got some great ideas from the names of stunt performers, key grips and everyone else involved in making movies. Bayless and her husband finally settled on Asher for their little boy, and she says now she honestly can't even remember the other top contender on their list. Nowadays, when it comes to baby names, the options really are limitless (think celebrity offspring like Apple, Banjo, Hermes). And social scientists talk about something they call the paradox of choice: too many options can lead to indecision and fewer choices really can reduce our overall anxiety. As our expectations rise, we put too much pressure on ourselves to make the perfect decision, and so sometimes we can’t make one at all. In these cases, researchers believe, less really is more. So it may just be that when it comes to something as important as naming your child, the old-fashioned way works best after all. Put down the iPhones and get out paper and pen, Marissa Mayer and Zachary Bogue, and make a list all on your own. Enjoy the baby bliss, and don't worry -- in a few weeks you'll be so sleep-deprived, you won't have any energy left over to second-guess your name choice anyway. Jacoba Urist is a lawyer, writer, and mom in Manhattan. She is Forbes contributor, where she covers financial, legal and parenting news, and has written for The Atlantic, Newsweek/TheDailyBeast and The Wall Street Journal. Follow her on twitter @thehappiestpare. Is trademarking a baby name going too far? Trending baby names: Zebulon, Django, Gatsby?